1. Door gifts for parties like birthday and weddings. 2. Recognition for staffs at company level. 3. For renovation, normally convenient for those who wish to have their homes laden with 3-Coins embedded in underlying layers of the floor and walls. The secret formula tycoons used when building their homes or shops is to bury 3-Coins under the floor of the maindoor, scattered throughout the floor of living rooms and bedrooms of the home and under the floor of the backdoor. Our special three coins tied securely with "trinity knots" are made from high quality bronze coins from three powerful reigns (Kang Hsi, Yung Cheng and Chien Lung). We are extra particular about how the coins are tied together to ensure the trinity union of mankind, earth and heaven is properly realized and secured, with three knots done on each coin. Three coins loosely tied together in other manners may not be as potent. We had also noticed some retailers who might not have known chinese text and culture tying them into triangular shape, which is said to mean the sign of death, thus causing all the three lucks to diminish for those who carry them. Please avoid those types by all means. The tying of the coins by our skillful workforce takes at least 15 minutes for each piece. These coins are made from genuine bronze with long reliability and lifetime. 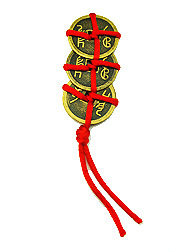 The coins are immaculately tied with thick red thread. These coins will be properly cleansed and neutralized before we ship them out, therefore good chi is guaranteed. What 3-coins symbolizes and how to place this object? 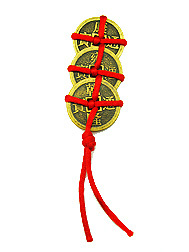 3 Kang Hsi coins or 3 Chien Lung coins tied together in a red thread makes it a specially powerful emblem or fortune magnet for prosperity. The better version would be having three successive Kang Hsi (1661-1722), Yung Cheng (1723-1735), Chien Lung (1736-1796) coins tied together to signify support and excellent feng shui from three of the most outstanding generations for longer term of wealth success. The coins must be made of strong metal such as brass, bronze, silver or gold. Some versions are made of resin and brittle in nature, try not to get those version because they lack in metal energy. 1.Carry them in your pocket, purse or wallet wherever you go to ensure you carry with you wealth energy that could tap opportunities and create abundance for you. 2. Activate your wealth luck by displaying them in the four corners of every room in your home and office. This will guarantee that every corner of your house is filled with wealth energy. 3. To increase your business fortune, stick three of the coins tied with red thread onto all your important files, bank books, invoice books, order books, cheque books, in your cash boxes and safes and any folder related to your income. 4. Similarly you can stick this potent wealth attractor onto your fax machines, cash registers and computers to attract opportunities through these avenues. Remember that the yang side must always be up! 5. Hang three coins on the inside doorknob of your shop's main door. This symbolizes that prosperity has already entered your office. On the external side of the doorknob, hang a pair of bells which attracts good fortune chi to enter your office. The sound of bells symbolically 'announces' imminent prosperity and good news. This 'coins and bells' tip is particularly effective for companies or establishments engaged in the trading, wholesale or retail businesses. 6. You may also tape 3-coins in southeast corner of your bedroom, workdesk, living room etc to activate your wealth corner. Be creative! a. For average homes (eg. <5000 sq feet), maindoor = 68 pieces, scattered through other parts of the home = 100pieces, backdoor = 38 pieces. b. For bigger homes (eg. >5000 sq feet), maindoor = 188 pieces, scattered through other parts of the home = 888 pieces, backdoor = 88 pieces. Note: Feng Shui Bestbuy offers coins of good quality material that are made from strong brass and bronze. Try not to get those coins that are made from resin because they are brittle. It is advisable to refresh these coins each year on the first day of the Lunar New Year. It is best to get new ones, or you can cleanse them using incense smoke of genuine sandalwood or singing bowl.